"I myself feel that our country, for whose Constitution I fought in a just war, might as well have been invaded by Martians and body snatchers." 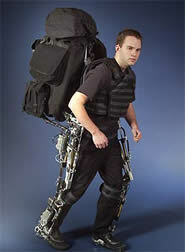 Special exoskeletons that would allow an ordinary human being to walk in doubled gravity. How can space explorers walk around easily when the surface gravity of a celestial body is twice that of the Earth? "... may I suggest that you make sure you don't get those drive-units in the suits backward? I'd hate to have them sit on me as well as a doubled gravity." "I can't even stand up without the aid of this thing. Let's go." From The Brain Pirates, by John W. Campbell. Note that this precedes Heinlein's powered suit by about twenty years. However, it is really not a fully-powered exoskeleton. It appears to be primarily intended for walking, climbing, standing - lower-body muscle amplification. Penton faced the strange inhabitants and slowly raised both hands above his head in a gesture of friendship. He'd intended to hold them out horizontally in front of him, but the effort, under that gravity, was distinctly uncomfortable. The Atomic-Powered Lifting Suit is remarkably similar to the Berkeley Lower Extremity Exoskeleton (BLEEX), yet another DARPA project.